Mumbling indie rock steeped in longing, “Never Lonely” from Boston’s Space Mountain is a literary first-person tale of denial as sung by Ava Trilling (Forth Wanderers). 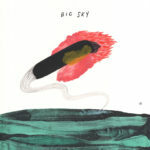 The musical sobriquet of Cole Kinsler, Space Mountain will issue Big Sky — its first international release — on 26 August through Dust Etc (US) and Super Fan 99 (Europe). Stream “Never Lonely” below and pre-order Big Sky via Bandcamp.